Today I decided to be very brave and make some Christmas wreaths with Ethan. 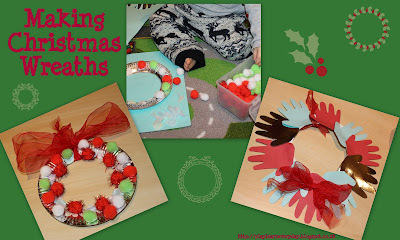 I like the idea of using a paper plate with the middle cut out and just sticking things to it (so we used red, green and white pom poms) and I love handprints, so we made two wreaths. I started by tracing Ethan's hand onto a piece of card, then after cutting out the first handprint I traced that one onto different colours of card. I then cut a circle out of the middle of a paper plate and covered it in glue for Ethan to stick the hand prints on. This really was quite a challenge as Ethan was much more interested in pulling things off the wreath than putting things on it! So to be perfectly honest it was all about the experience of playing with the materials and the glue and after Ethan moved onto other toys I stuck everything back on that he had pulled off! It was a similar process for the pom pom wreath cut this time we used blue tack as well as glue to stick the pom poms onto the paper plate. This activity was great for his development in a number of ways and these sort of crafty activities will continue to challenge him for years to come. Today it was great for his Creative Development as he was choosing where to put the items. But it was definitely more about his Physical Development as he stuck things on and took them off again!